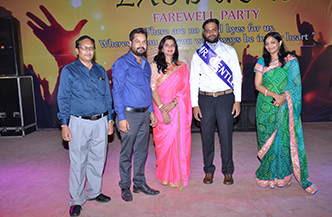 Rajasthan Institute of Engineering & Technology organized the farewell party “Exodus” on 28.4.18 at the college main stage, where students of B.Tech 3rd year bid farewell to the final year with great enthusiasm. Function began with the lamp lightening ceremony by respected Principal, RIET Prof. (Dr.) Saroj Hiranwal, Prof Sachin Sharma vice Principal (RIET) & all the respected HODs. Principal, RIET Prof. (Dr.) Saroj Hiranwal, wished the final year students the very best for their future. Speaking on the occasion she said that RIET is proud of the many achievements of the final year students over the years, the various accomplishments in almost all curricular and extra curricular activities. The brilliant achievements in academic discourse and in sports are indeed acknowledged. The memories of each student will forever remain in hearts of all RIETians. The students of 3rd year presented a dance, a duet song and various performances. 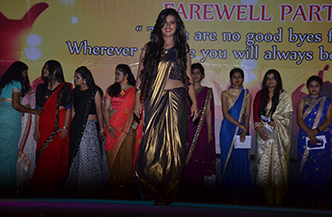 The students of final year then participated in the ramp walk which was thoroughly enjoyed by the crowd. Different tags were awarded to the final year students as a token of love. 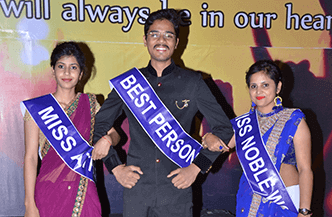 A special performance was arranged for the selection of “Mr & Miss Farewell” and the award of Mr. Farewell was presented to Mr. Manu Pratap Singh Shekhawat and the award for Miss Farewell was presented to Miss Malvika Upadhyay. The show ended with a DJ night where students enjoyed the music and dance and dinner.